After 50 full length album releases to date and tours to the African continent, Europe, North and South America this band from Saint Croix in the US Virgin Islands, whose shows can often last over two hours, have set a new standard for roots reggae. The band's most recent January 2013 release is Free Indeed on the Higher Bound label. Word sound and power from these St. Croix griots. Brothers Vaughn and Ron Benjamin have shaped a sound that travels throughout the universe with its bottom heavy, improvisational styling. The message addresses any subject under the sun that affects humanity to the highest degree. culture, spreading the thoughtful and evocative voice of the Hawaiian people across the world. Not content to be merely a widely respected artist, Paula has taken on the mantle of cultural ambassador---using her talent as an instrument to help bring about positive social change within her islands and beyond. Reggae grooves infused with jazz, rock, soul and funk flavors. Christian "Krsna" Czingula sings original vocals in a potent style with intricate, vigorous piano lines and insightful lyrics along with a full band including percussion and violin. Northwest, holding the infamous Wild Out Wednesday at the Wild Buffalo in Bellingham, WA where the dance is always packed and the riddims, mash ups and special guests run deep. Edited 1 time(s). Last edit at 04/19/2013 06:25PM by Ras Danny. WOW! Midnite is on fire like I have never witnessed before. Two songs that stood out to me the most over the sets was Carboniferous Land in Provolt and Old Robe in Seattle. I have never seen either live before and was IN AWE! Big up to Juliette Mountain- Roots Family Production, Ras Danny of Higher Reasoning Reggae times, Justine Ketola, Luke with Ises Productions, Red Fyah of SoulJah Sound and Todd. Look forward to the next time you all bring Midnite out to the NW!! Set list from the Portland show? anyone? They played "Jah Ovah"... was incredible. Jah Ovah was my favorite song in PDX. Lets see they opened with Jah Ova (remember Jah). Mama Africa, Freedom, I chant, Ras to the bone, Love the Life you live, Proceed, Ahlookova, mongst InI. That is what i can remember right now. They played a song I had never heard before that night and my friend Todd said he had only ever heard it once live before and it has never been released. I will ask him what the name of it was. Edited 1 time(s). Last edit at 04/24/2013 07:37PM by rossta8888. Might have been Old Robe, but I can't remember. I thought Jah Ova and Remember Jah are one and the same? Old Robe off of Assini was played sunday night in Seattle and was the song of the weekend for me along with Carboniferous Land in Provolt. I know they did not play it in Portland. What I meant when I said Jah Ova was Ahlookova off Aneed. They did open with Jah Ova or Remember Jah, one and the same. But it was Ahlookova played later that night that had me going crazy! Edited 1 time(s). Last edit at 04/24/2013 07:52PM by rossta8888. Can you add to any of the songs listed BZM? I know there is a couple im forgetting. The song I talked about in earlier post was never released on CD and my freind told me the last time he heard it was at the Roseland when they played there in 07. I will get the name of it soon. Due Reward! Song came on at work today and I remembered they played it at the Portland show! NOMO!!!!!! You are too kind! The whole set from San Francisco show!!!! I am off at 4pm and on my way home to watch and listen! Give thanks! I never even opened the Zoom recorder still in the box. In fact I didnt even bring it on the trip. I want to talk to Ron about it and if its okay plus Haile before I open it. Wish I could return the favor. Did you see Midnite is playing in Petaluma at the Mystic Theater July 5th! I hope they add another Nor Cal show saturday the 6th, no way would i miss that. Hmm...just saw that. I was hoping never to have to see them there again after the last time. Gotta believe there will be some more dates. What happened at the mystic last time? Am hoping to see em there - also hope other dates in sf Bay Area are set up. 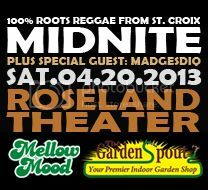 I ll head to Reno as well....love that midnite!! I grew up in Sonoma County and never had a problem with shows at the Mystic. I have never seen Midnite there though. I to am curious about the Mystic. If I am driving 10 hours to be there I dont want a venue that will give them a 45 minute set. LOL. I love your crystal ball Daniel !!!! I wonder if that New Parish show would be July 6th? LOL Either was I am coming to the Show July 5th as I am sure there will be a saturday Nor Cal show the following night. Will not miss two more nights of Midnite! This last tour in the NW was epic and they are better than ever IMO. i have been to the mystic many times and enjoyed myself, but it seems like their mellower days have passed. Sound is boomy, it has been every time i've been there, i'm sure it's the theater, not blaming anyone, i just like the sound better at many other venues. So in the middle of the last midnite show i went to there an employee comes on stage and tries to offer Vaughn a water which he waved away. maybe it was just me but it seemed to mess with the flow of the show. i pulled out a likkle spliff and before i had taken the second puff, security was there taking away my spliff. So in the middle of this long show i went outside and missed some of 'I Chant' which i did not like one bit. last time i was there was for groundation last year, security was so pre occupied freaking out about possible underage drinking, they were running around with flashlights looking into the cup of every sweet young thing there, and there were many. they had signs on the doors that said no ins and outs under 18, they told me it was because the youngsters have booze in their cars and they will run out and have a few drinks and come back. So honestly i haven't been there since then as i will try and see an act elsewhere. Don't get me wrong, i love petaluma and go through there all the time. saw alborosie there a year and a half or so ago, and it was so packed security couldn't get thru the crowd, let alone hassle you for puffing. picky yes, spoiled yes, but we have such a wealth of venues here i can be that way. i don't like going outside to puff. I do like DJ Jacques who i see there regularly! All that being said, i'll see you guys there for the show! Ouch, I was hoping that New Parish show would be the 6th. Hard for me to miss more work after the last Midnite tour and SNWMF. Maybe they will add a Nor Cal show on the 6th. Daniel, Irie Dan is not doing the Mystic Theater show this time around. Do you know who is doing it Aaron? You get those SNWMF tickets yet? Hoping to see you in June!